There is nothing quite like the taste of caramel. To add a little bit of marijuana magic to it all, we have created an easy recipe to making your very own cannabis-infused variety at home. With an increasing need to consume cannabis both in a way that is health conscious and discrete, medicated edibles are a great way to tick all the boxes and satisfy the munchies! This is a very quick and simple recipe for cannabis caramels to get you started on your edible adventure! To start the process, you need to heat your pan to a fairly low temperature in order to ensure you retain as much of the potency from your cannabutter as possible. Slowly melt all the butter in the pan. Once all the butter has melted, add your sugar and salt then continue to stir until the mixture is fully combined. Next, you’re going to add your condensed milk and optional corn syrup to the mixture. You need to make sure you pour slowly, stirring as you go. Break up all the clumps so you get a smooth texture throughout. Keep the temperature between low and medium heat. Preheat your oven to 100°C and spread your mixture over some greaseproof or waxed paper. Place on a baking tray in the oven and wait 12-15 minutes. Once you have a consistent gloop of caramel, remove it from the oven and stir in the vanilla extract. Alternatively, you can continue to mix the caramel in the pan at 110°C, making sure the pan doesn’t get too hot. Add the vanilla extract after about 12-15 minutes or when the caramel turns into a thick goo and hardens. Continue stirring until the vanilla extract is spread evenly through the ball of caramel. 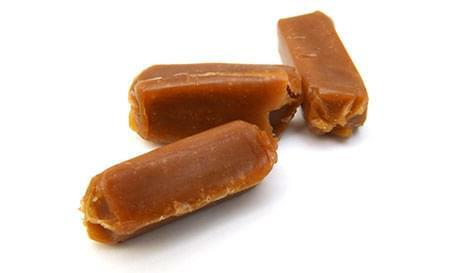 Now you can cut the caramel into portions and place on Pyrex or wax paper to cool. Once it’s cool, it will be ready to dish up and serve how you like! Remember, cannabis edibles can take 45-90 minutes to take effect, so go slowly with the dosing!